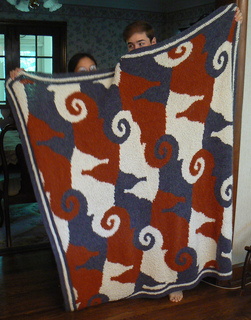 This afghan is designed after a tessellation by M.C. Escher. 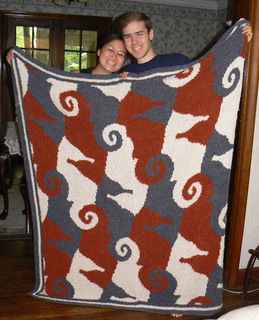 The pattern includes a graph of the repeating pattern, which is made with three contrasting yarns. 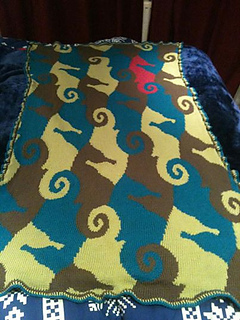 I doubled each yarn, to make the afghan a little heavier. You can use any weight that you like; the gauge isn’t important. 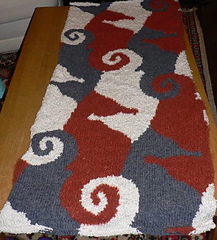 The instructions are for knitting two panels, which are then sewn together. The right panel begins with row 124. (An error on the original upload was corrected on 7/27/09). I’ve added another graph, for those who want to knit it all in one piece. Please let me know if you have any questions or problems with the pattern (this is my first). Also, I’d be most grateful if you’d send me a photo of your FO. Hope you enjoy it!